Howie is my best friend and singing partner. He enjoys getting his bally, giving paw, singing and jumping around. Everyone that meets him says he is the best looking Schnauzer they ever seen. Wow your little Howie is a very special little dog. What eyes, what personality! He's great in his costume or is he really a super hero? I want to respond to "eh" who was not a fan of Howie. Sounds like someone is jealous of the Howie. Howie a great singer and so cuddly. I give my vote to Howie the howlin' schnauzer. He's sooooo cute ! ! ! I'm not really a fan of this dog. Howie looks like an Angel sent down from heaven by Jesus Christ himself. Try best looking dog in the world! Oh my god he's adorable! 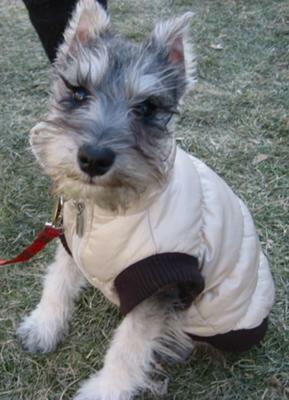 This schnauzer is unresonably good looking!! I want to hold him!